Wide availability and inexpensive purchase cost is what makes chain drive garage door openers among the most widely used in the United States. They also have the benefit of being quite easy to maintain yourself. With a bit of regular attention, you chain drive opener should give you many years of trouble-free service. Here are a few tips to keep your opener in top condition. Even the best chain drive opener is subject to some vibration in use, due to the way it’s engineered. This can result in hardware working loose over a period of time. Therefore it pays to inspect all the associated nuts, bolts and screws every few months. Tighten up any that have started to loosen. Neglecting this simple task can result in a broken or binding chain eventually, or perhaps even parts falling free and getting damaged. The vibration generated by a chain drive opener can be greatly reduced if you lubricate the chain occasionally. You just need to use light machine oil or WD-40 for this. Apart from helping the door opener mechanism to run smoothly, keeping your chain oiled will also reduce noise from the opener and help the door to open and close smoothly, reducing the load on the motor. Check the chain on your door opener for slack once a year. If there is slack in the chain, you can get rid of it by turning the limit screw on the power unit until the chain is taught. Be careful not to over-tighten the chain though. Slack is sure to develop in the chain from time to time as it stretches. However, it’s important to reduce this slack; otherwise the door will close heavily and/or will not open all the way. If any of the door rollers are sticking, you might need to replace them. However, do NOT attempt to replace the bottom rollers yourself. This is a task for a professional garage door technician. 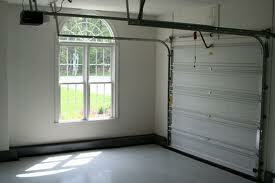 Most garage door openers come with a light fitted. This is used to light up the garage when the door is opened. Every six months or so you should remove the transparent light cover and give it a clean. Also give the inside of the light area a wipe out. To make sure you never have to deal with a failed bulb plunging you into darkness, it’s worth replacing the bulb every 18 months. All of these maintenance tasks are easy to perform yourself and will make a big difference to the life expectancy of your chain drive door opener. While a chain driver opener is relatively inexpensive to purchase, a little preventative care will save you having to replace yours before its time. This entry was posted in Blog and tagged garage door, garage door opener. Bookmark the permalink.